The Cast: John Brotherton, Alex Essoe, Anita Briem, Neil Sandilands, Simon Rex. 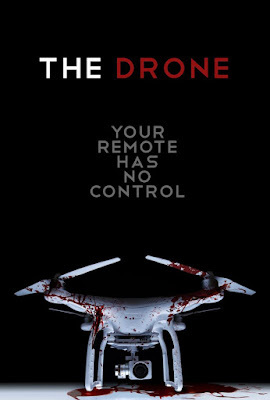 The Story: A newlywed couple is terrorized by a consumer drone that has become sentient with the consciousness of a deranged serial killer. Some might not think a phrase like "From the creators of Zombeavers" to be a high compliment but in the movie world we live in it definitely is. Back in 2014, writer and director Jordin Rubin, along with co-writers Al and Jon Kaplan, unleashed what would become a cult classic about zombie beavers attacking a group of party goers and the results were hilarious. 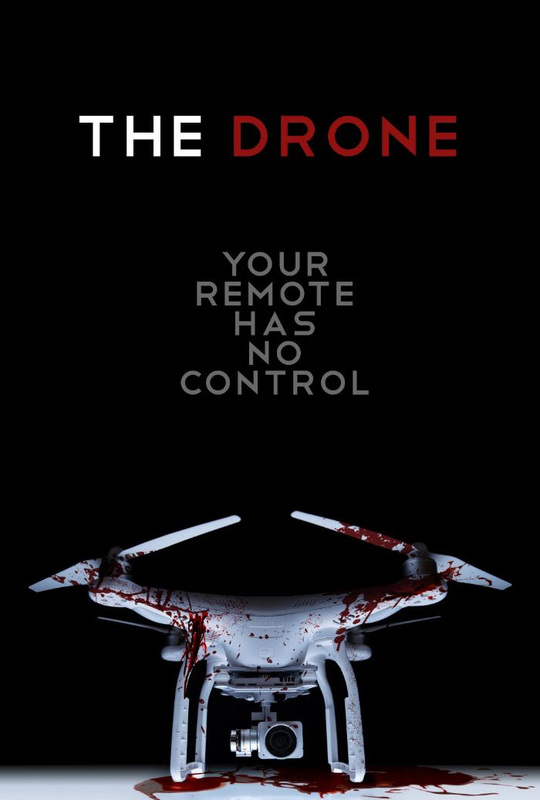 The same campy and reverential spirit that made that movie such a fun experience has been uploaded and embedded into the team's latest movie which features a killer drone, because of course it does. 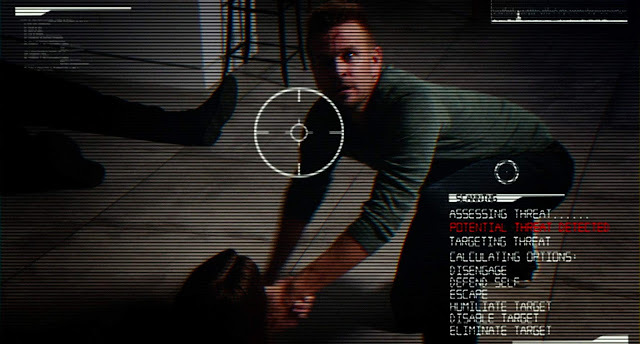 Tapping into our technological fears and mixing it up with a gigantic pile of horror nostalgia, The Drone, official selection of the 2019 Slamdance Film Festival, definitely has the right look and feel that you are hoping for. The story is more comedy than horror and the entire production just has the look and feel of those 80's horror movies we watched late at night on cable TV or on VHS tapes that randomly popped up at the video store. You know, the ones you would find after searching the racks for what seemed like hours and the pictures and description on the back are what got your attention more than anything else. Yeah, that's this movie to a tee. Oddly enough, I recently watched Chopping Mall, an 80's cult classic, for the first time since I was a kid and I feel like that was the perfect primer for watching a modern twist on the technology gone wrong plot device. In that movie, a lightening strike brings three security robots to life and the first thing they decide to do is go on a killing spree. Because of course that's what they would do. The Drone also features a lightening strike but this time it takes the mind (and soul?) of a serial killer guy and fuses him into the very thing he was using to find and kill people with. Fun stuff, right? Just because this movie is about technology, don't expect any big budget special effects, the emphasis is on creating that old school, low budget, indie film style and the film makers deliver from beginning to end. One thing you can expect is intentionally bad dialog. At least I hope it's intentional, otherwise I feel bad typing this. There are so many corny one liners, every character gets in on the act and I feel like the writing team must have held a contest to see how many they could get in. 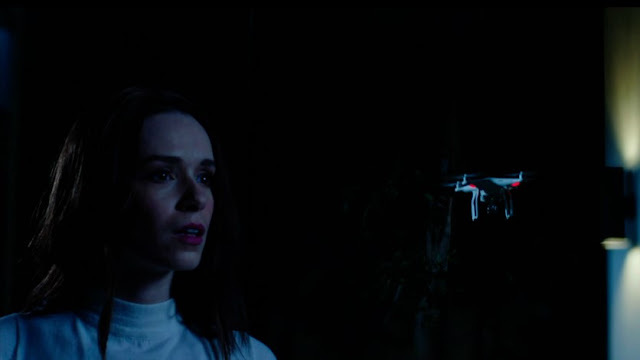 The Drone is a fun horror comedy that is filled with cheesy, goofy antics and enough crazy plot twists to keep you engaged all the way to the movie's outrageous conclusion. Genre fans and people who enjoy a little absurdity mixed into their cinematic experience will definitely dig this throwback throw down.